BUDDY SALTZMAN R.I.P. ROCK IN PERPETUITY! THIS MORNING I WAS AWAKENED BY A FACEBOOK POST FROM MY FRIEND ARTIE KORNFELD, “THE FATHER OF WOODSTOCK, ” THAT OUR FRIEND BUDDY SALTZMAN HAD PASSED AWAY. I USED BUDDY ON MY DEMOS WHEN I WAS A STAFF WRITER AT ALDON AND MASTERS WHEN I STARTED PRODUCING. (“MEET ME AT MIDNIGHT MARY”). HE WAS ALWAYS MORE THAN HELPFUL IN FINDING THE “RIGHT THING TO PLAY” AND WAS WILLING TO SPEND WHATEVER TIME IT TOOK TO EXECUTE IT PROPERLY SOMETIMES WITHOUT CHARGING ME. “Buddy Saltzman was, from 1955 through 1968 the most used studio drummer in recording history.You have in your collections many hits from “The Locomotion to”, “Any One who had a heart” and on and on. 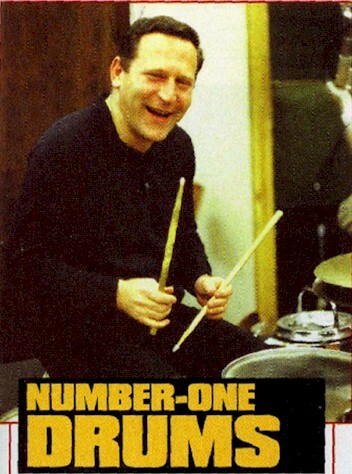 Buddy must have the most #1 records he played drums on.He did about 100 sessions with me.He even played on “The Rain,ThePark, and Other Things”. John Cowsill now drummer for a long time with Mike Love and the Beach Boys , in gratitude has kept contact with Buddy and brought much happiness.A year ago, when the Boys played in Palm Beach John invited me and surprised me by putting me next to Buddy.His walker that he needed broke my heart . Buddy died 3 days ago and was buried today. I was going to go until I found out that his gravesite was within 30 yards of Linda Kornfeld,The Mother of Woodstock. BUDDY…MAY YOU ROCK IN PERPETUITY! and Kicking, and the Cowsills first and iconic hit, THE RAIN – THE PARK. The Lord got a great drummer. ARTIE..I WAS SAD TO HEAR OF THE PASSING OF BUDDY SALTZMAN..WHEN I WORKED FOR BOB CREWE IN THE LATE 60’S I REMEMBER HE RARELY DID A SESSION WITHOUT BUDDY, WHO ACCENTED THOSE FRANKIE VALLI/FOURSEASONS HITS IN HIS UNIQUE STYLE..HE PLAYED ON MY EARLY DEMOS AND MANY OF MY FRIENDS..I HOPE HE I NOW AT PEACE PLAYING IN THE BEST BAND IN HEAVEN..
AND HERE’S THE ANTHEM THAT WILL WELCOME BUDDY AT THE GATE… WRITTEN BY ALAN O’DAY AND JOHNNY STEVENSON “IF YOU BELIEVE IN FOREVER LIFE IS JUST A ONE NIGHT STAND…IF THERE’S A ROCK AND ROLL HEAVEN”, YOU KNOW THEY’VE GOT A HELL OF A BAND! These are personal tributes to my friends or major influences in my life who have passed away. R.I.P. May they ROCK IN PERPETUITY! Just click onto the name. JOHN BARRY R.I.P. ROCK IN PERPETUITY! FREDDY BIENSTOCK R.I.P. ROCK N PERPETUITY! JOHN BRAHANEY R.I.P. ROCK IN PERPETUITY! JOHNNY CASH R.I.P. ROCK N PERPETUITY! RAY CHARLES R.I.P. ROCK IN PERPETUITY! HERB COHEN R.I.P. ROCK IN PERPETUITY! CLAY COLE R.I.P. ROCK IN PERPETUITY! BO DIDDLEY R.I.P. ROCK IN PERPETUITY! DENNY DOHERTY R.I.P. ROCK N PERPETUITY! DOUG FIEGER R.I.P. ROCK IN PERPETUITY! CHARLIE FACH R.I.P.ROCK IN PERPETUITY! REDD FOXX R.I.P. RAUNCH IN PERPETUITY! AL GALLICO R.I.P. ROCK N PERPETUITY! ALAN GORDON R.I.P. ROCK IN PERPETUITY! IRVING GREEN R.I.P. ROCK N PERPETUITY! A TRIBUTE TO FLORENCE GREENBERG! ELLIE GREENWICH R.I.P. ROCK IN PERPETUITY! BUDDY HOLLY R.I.P. ROCK N PERPETUITY! LENA HORNE R.I.P. ROCK IN PERPETUITY! RICK JAMES R.I.P. ROCK N PERPETUITY! REVEREND MARTIN LUTHER KING R.I.P. ROCK IN PERPETUITY! SHEILAH KENT R.I.P. ROCK IN PERPETUITY! SYLVIA KRISTEL R.I.P. ROMP IN PERPETUITY! STEVEN KURTZ R.I.P. ROCK IN PERPETUITY! VAN MCCOY R.I.P. ROCK N PERPETUITY! JOHNNY MAESTRO R.I.P. ROCK IN PERPETUITY! HUEY MEAUX R.I.P. ROCK IN PERPETUITY! BOB MARLEY R.I.P. RASTAMAN IN PERPETUITY! JACKIE MILLS R.I.P. ROCK IN PERPETUITY! WILLIE MITCHELL R.I.P. ROCK IN PERPETUITY! MARTY OSTROW R.I.P. ROCK IN PERPETUITY! STEVE PAUL R.I.P. ROCK IN PERPETUITY! FREDDIE PERREN R.I.P. ROCK N PERPETUITY! IRWIN PINCUS R.I.P. ROCK IN PERPETUITY! ELVIS PRESLEY R.I.P. ROCK IN PERPETUITY! BILLY PRESTON R.I.P. ROCK N PERPETUITY! BEN RALEIGH R.I.P. ROCK N PERPETUITY! LOU RAWLS R.I.P. ROCK IN PERPETUITY! BOB RENO R.I.P.”ROCK IN PERPETUITY”! ALLAN RINDE R.I.P. ROCK IN PERPETUITY! SOUPY SALES R.I.P. ROCK IN PERPETUITY! SIDNEY SHELDON R.I.P. ROCK N PERPETUITY! SHELBY SINGLETON R.I.P. ROCK IN PERPETUITY! ELIZABETH TAYLOR R.I.P. ROCK IN PERPETUITY! LUTHER VANDROSS R.I.P. ROCK N PERPETUITY! RANDY WOOD R.I.P. ROCK IN PERPETUITY! JERRY WEXLER R.I.P. ROCK IN PERPETUITY! BARRY WHITE R.I.P. ROCK IN PERPETUITY! WARREN ZEVON R.I.P. ROCK N PERPETUITY! Special Thanks to Sharon Link for her help in creating this compilation.